Hedge funds are the playground of well-heeled and institutional investors. But lower-fee exchange-traded funds (ETFs) offer similar strategies. While earning hedge fund-like returns in an ETF wrapper may be an enticing way to reduce risk or court strong performance, retail investors need to do their homework because these offerings differ vastly and can have limitations. Hedge funds were originally designed nearly 70 years ago to offset risk from market volatility by buying high-conviction stocks and shorting potential losers. Today’s versions, which include a myriad of strategies, might use leverage and aim to deliver “alpha,” or market-beating returns. A global-macro strategy, for instance, makes bets based on political or economic events, while merger arbitrage involves speculating on successful mergers and acquisitions. 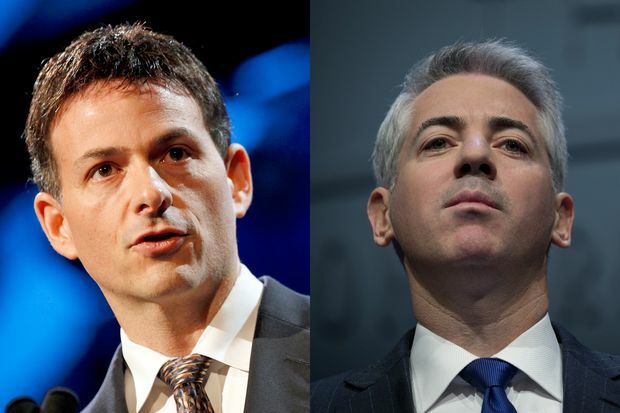 Some ETFs hold stocks that hedge-fund gurus David Einhorn, left, and Bill Ackman have invested in. Hedge funds often charge a 2-per-cent management fee plus a 20-per-cent performance fee for hitting benchmarks. Lock-up periods and early-redemption fees are common, while many require an investment of $500,000 to $1-million plus. Some hedge-fund-style ETFs are designed to deliver returns with low correlation to the broader markets. Some mimic an index tracking hedge-fund performance. Others own stocks held by hedge funds. Investors seeking diversification through alternative investments – meaning vehicles beyond stocks and bonds – might consider an allocation of 5 to 15 per cent to hedge fund ETFs, Mr. Straus says. But they also need to pay close attention to fees, or management expense ratios (MERs), which can range from roughly 0.5 to 1.3 per cent, says the Toronto-based analyst. A big advantage of investing in ETFs in general is the ability to control costs and compound returns over time, but “this category of products is among the costliest,” he says. The Horizons Seasonal Rotation ETF (HAC), which invests in sectors and currencies that are seasonally in favour, and Purpose Multi-Strategy Market Neutral Fund ETF (PMM), which aims for positive absolute returns regardless of whether markets are up or down, offer “some of the purest hedge-fund exposures” in the Canadian market, says Mr. Straus. Both are actively managed funds compared with their U.S. peers, which typically track rules-based indices. The Horizons Seasonal Rotation ETF, which invests in other ETFs, posted an annualized 7.8-per-cent return for five years ending April 30, or 8.3 per cent since 2009. “That’s quite impressive for the amount of trading it does,” which increases transaction costs, he says. It’s also one of a few Canadian ETFs charging a performance fee. Another fund to consider is the Horizons Global Risk Parity ETF (HRA), which focuses on a strategy pioneered by U.S. hedge-fund giant Bridgewater Associates and founder Ray Dalio. It really behaves more like a balanced fund, says Mr. Straus. Bridgewater invests in assets according to their volatility and uses leverage to enhance fixed-income returns. While the Horizons ETF invests in stock-and-bond ETFs, it doesn’t use leverage, Mr. Straus notes. Another fund, the Horizons Morningstar Hedge Fund ETF (HHF), falls into a group that tracks an index offering exposure to hedge-fund performance. Because this ETF uses derivatives – in this case, futures and forward contracts – for assets ranging from bonds to commodities, “investors should be comfortable with that structure and understand how it works before they consider it,” he suggests. Similarly, U.S.-listed IQ Hedge Multi-Strategy Tracker ETF (QAI), which is the largest ETF in the alternative-asset space with US$1.1-billion in assets, tracks an index offering hedge-fund performance. Its annualized return has been about 4 per cent since inception in 2009. Some ETFs invest in top stocks owned by renowned hedge funds. While this corner of asset management has a reputation for secrecy, these funds are still required by securities laws to report their holdings 45 days after the quarter ends. The Canadian-listed Purpose Best Ideas Fund ETF (PBI) owns stocks held mostly by hedge fund managers, including Carl Icahn of Icahn Capital LP, Seth Klarman of Baupost Group LLC, Nelson Peltz of Trian Fund Management LP, Bill Ackman of Pershing Square Capital Management LP and David Einhorn of Greenlight Capital Inc. The U.S.-listed Global X Guru ETF (GURU) and Goldman Sachs Hedge Industry Fund VIP ETF (GVIP) are among funds tracking indexes of stocks held by hedge fund managers. “In theory, this is smart money choosing individual stocks, so you are piggybacking off someone else’s ideas,” says Todd Rosenbluth, director of ETF and mutual fund research at the New York-based independent research firm CFRA.